Happy Monday! It's release day for Whimsy and Stars Studio, and I am so happy to introduce you to Penelope. Isn't she adorable? DP's used are from MME and WE R Memory Keepers, cardstock and ribbon from PTI. Penelope is in shop at Whimsy and Stars Studio and ready for instant download. Be sure to stop by the Studio blog to see all the delightful inspiration the rest of the design team whipped up for you! fabulous colors on your card!!! 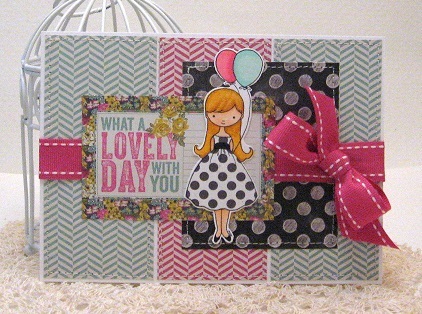 Love your color choices for this darling card! Adorable image and your choice of card colors is super.